For the practice of filling a body of water to create new land, see Land reclamation. For other uses, see Landfill (disambiguation). "The dump" redirects here. For other uses, see The Dump. A landfill site (also known as a tip, dump, rubbish dump, garbage dump or dumping ground and historically as a midden) is a site for the disposal of waste materials by burial and is the oldest form of waste treatment (although the burial part is modern; historically, refuse was just left in piles or thrown into pits). Historically, landfills have been the most common method of organized waste disposal and remain so in many places around the world. 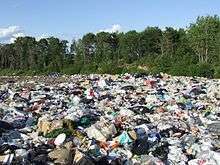 Some landfills are also used for waste management purposes, such as the temporary storage, consolidation and transfer, or processing of waste material (sorting, treatment, or recycling). A landfill also may refer to ground that has been filled in with rocks instead of waste materials , so that it can be used for a specific purpose, such as for building houses. Unless they are stabilized, these areas may experience severe shaking or soil liquefaction of the ground during a large earthquake. During landfill operations a scale or weighbridge may weigh waste-collection vehicles on arrival and personnel may inspect loads for wastes that do not accord with the landfill's waste-acceptance criteria. Afterward, the waste-collection vehicles use the existing road network on their way to the tipping face or working front, where they unload their contents. After loads are deposited, compactors or bulldozers can spread and compact the waste on the working face. Before leaving the landfill boundaries, the waste collection vehicles may pass through a wheel-cleaning facility. If necessary, they return to the weighbridge for re-weighing without their load. The weighing process can assemble statistics on the daily incoming waste-tonnage, which databases can retain for record keeping. In addition to trucks, some landfills may have equipment to handle railroad containers. The use of "rail-haul" permits landfills to be located at more remote sites, without the problems associated with many truck trips. Typically, in the working face, the compacted waste is covered with soil or alternative materials daily. Alternative waste-cover materials include chipped wood or other "green waste", several sprayed-on foam products, chemically "fixed" bio-solids, and temporary blankets. Blankets can be lifted into place at night and then removed the following day prior to waste placement. The space that is occupied daily by the compacted waste and the cover material is called a daily cell. Waste compaction is critical to extending the life of the landfill. Factors such as waste compressibility, waste-layer thickness and the number of passes of the compactor over the waste affect the waste densities. Landfills are often the most cost-efficient way to dispose of waste, especially in countries like the United States with large open spaces. While resource recovery and incineration both require extensive investments in infrastructure, and material recovery also requires extensive manpower to maintain, landfills have fewer fixed—or ongoing—costs, allowing them to compete favorably. In addition, landfill gas can be upgraded to natural gas—landfill gas utilization—which is a potential revenue stream. Another advantage is having a specific location for disposal that can be monitored, where waste can be processed to remove all recyclable materials before tipping. Landfills have the potential to cause a number of issues. Infrastructure disruption, such as damage to access roads by heavy vehicles, may occur. Pollution of local roads and water courses from wheels on vehicles when they leave the landfill can be significant and can be mitigated by wheel washing systems. Pollution of the local environment, such as contamination of groundwater or aquifers or soil contamination may occur, as well. Rotting food and other decaying organic waste allows methane and carbon dioxide to seep out of the ground and up into the air. Methane is a potent greenhouse gas, and can itself be a danger because it is flammable and potentially explosive. In properly managed landfills, gas is collected and utilized. This could range from simple flaring to landfill gas utilization. Carbon dioxide is the most widely produced greenhouse gas. It traps heat in the atmosphere, contributing to climate change. Poorly run landfills may become nuisances because of vectors such as rats and flies which can cause infectious diseases. The occurrence of such vectors can be mitigated through the use of daily cover. Other potential issues include wildlife disruption, dust, odor, noise pollution, and reduced local property values. Gases are produced in landfills due to the anaerobic digestion by microbes. In a properly managed landfill this gas is collected and used. Its uses range from simple flaring to the landfill gas utilization and generation of electricity. Landfill gas monitoring alerts workers to the presence of a build-up of gases to a harmful level. In some countries, landfill gas recovery is extensive; in the United States, for example, more than 850 landfills have active landfill gas recovery systems. Landfills in Canada are regulated by provincial environmental agencies and environmental protection acts (EPA). Older facilities tend to fall under current standards and are monitored for leaching. Some former locations have been converted to parkland. In the European Union, individual states are obliged to enact legislation to comply with the requirements and obligations of the European Landfill Directive. In the UK this is the Waste Implementation Programme. Landfilling practices in the UK have had to change in recent years to meet the challenges of the European Landfill Directive. The UK now imposes landfill tax upon biodegradable waste which is put into landfills. In addition to this the Landfill Allowance Trading Scheme has been established for local authorities to trade landfill quotas in England. A different system operates in Wales where authorities are not able to 'trade' between themselves, but have allowances known as the Landfill Allowance Scheme. U.S. landfills are regulated by each state's environmental agency, which establishes minimum guidelines; however, none of these standards may fall below those set by the United States Environmental Protection Agency (EPA). Permitting a landfill generally takes between 5 and 7 years, costs millions of dollars and requires rigorous siting, engineering and environmental studies and demonstrations to ensure local environmental and safety concerns are satisfied. The status of a landfill's microbial community may determine its digestive efficiency. Bacteria that digest plastic have been found in landfills. Landfills can be regarded as a viable and abundant source of materials and energy. In the developing world, waste pickers often scavenge for still-usable materials. In a commercial context, landfill sites have also been discovered by companies, and many have begun harvesting materials and energy . Well known examples are gas recovery facilities. 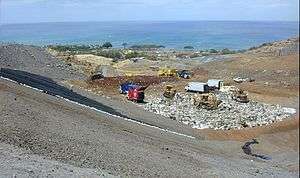 Other commercial facilities include waste incinerators which have built-in material recovery. This material recovery is possible through the use of filters (electro filter, active carbon and potassium filter, quench, HCl-washer, SO2-washer, bottom ash-grating, etc.). In addition to waste reduction and recycling strategies, there are various alternatives to landfills, including waste-to-energy incineration, anaerobic digestion, composting, mechanical biological treatment, pyrolysis and plasma arc gasification, which have all begun to establish themselves in the market. Depending on local economics and incentives, these can be made more financially attractive than landfills. Countries including Germany, Austria, Sweden, Denmark, Belgium, the Netherlands, and Switzerland, have banned the disposal of untreated waste in landfills. In these countries, only the ashes from incineration or the stabilized output of mechanical biological treatment plants may still be deposited. ↑ "Midden". Merriam-Webster. Retrieved 18 May 2014. ↑ "Alternative Daily Cover (ADC)". Retrieved September 14, 2012. ↑ "LFG Energy Projects". United States Environmental Protection Agency. Retrieved February 21, 2015. ↑ US EPA, "Solid Waste Disposal Facility Criteria; Proposed Rule", Federal Register 53(168):33314–33422, 40 CFR Parts 257 and 258, US EPA, Washington, D.C., August 30 (1988a). ↑ "CO2 101: Why is carbon dioxide bad?". Mother Nature Network. Retrieved 2016-11-30. ↑ Powell, Jon T.; Townsend, Timothy G.; Zimmerman, Julie B. (2015-09-21). "Estimates of solid waste disposal rates and reduction targets for landfill gas emissions". Nature Climate Change. advance online publication. doi:10.1038/nclimate2804. ISSN 1758-6798. ↑ "Modern landfills". Retrieved February 21, 2015. ↑ Gomez, A.M.; =Yannarell, A.C.; Sims, G.K.; Cadavid-Resterpoa, G.; Herrera, C.X.M. (2011). "Characterization of bacterial diversity at different depths in the Moravia Hill Landfill site at Medellín, Colombia". Soil Biology and Biochemistry. 43 (6): 1275–1284. doi:10.1016/j.soilbio.2011.02.018. ↑ Gwyneth Dickey Zaikab (March 2011). "Marine microbes digest plastic". "Modern landfills". Retrieved February 21, 2015. "Council Directive 1999/31/EC of 26 April 1999, on the landfill of waste" (PDF). Retrieved August 29, 2005. "The Landfill Operation Management Advisor Web Based Expert System". Retrieved August 29, 2005. H. Lanier Hickman Jr. and Richard W. Eldredge. "Part 3: The Sanitary Landfill". A Brief History of Solid Waste Management in the US During the Last 50 Years. Retrieved August 29, 2005. Look up landfill in Wiktionary, the free dictionary. Wikimedia Commons has media related to Landfills.